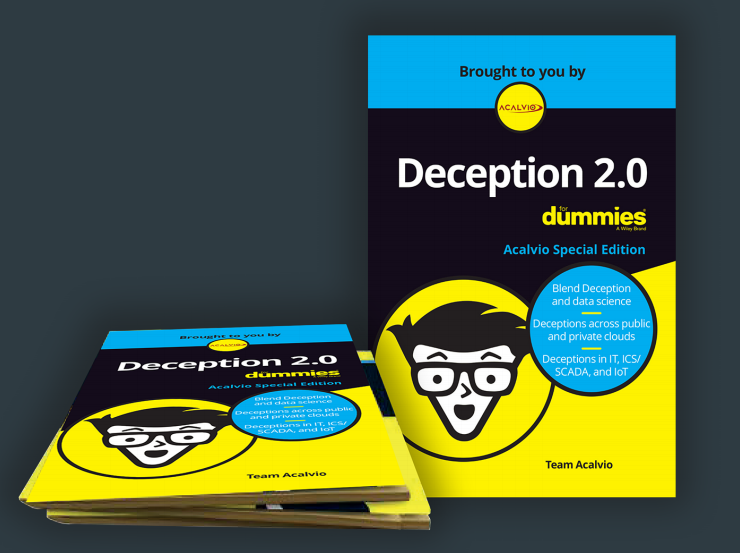 Santa Clara, Calif., May 18, 2017 – Acalvio Technologies, an innovator in Advanced Threat Defense, today announced the release of “Deception 2.0 for Dummies” (https://www.acalvio.com/deception-for-dummies-ebook). This eBook explains the fundamentals of the next generation of deception technology. Deception 2.0 approach, leverages advances in Distributed Deception technology, Data Science and Cloud architectures to deliver accurate, timely and cost-effective detection. Despite a greater awareness of advanced cyber threats, and a renewed focus on IT security, the number and scale of successful cyber-attacks continues to grow at an alarming rate. The Identity Theft Resource Center and CyberScout recently reported a record 1,093 data breaches in the United States in 2016 — a 40 percent increase over the near-record high reported in 2015. The Ponemon Institute’s 2016 Cost of Data Breach Study: Global Analysis estimated that the average total cost of a data breach in 2016 was $4 million and Juniper Research predicts that cybercrime will cost $2.1 trillion globally by 2019, averaging $150 million per breach by 2020. This demonstrates the immediate need for organizations to have a detailed understanding of the tactics, techniques and procedures (TTPs) of today’s emerging threats. Deception 2.0 for Dummies reflects on the need for early, accurate and cost-effective detection of breaches and insider threats. The eBook is available now at https://www.acalvio.com. Acalvio provides Advanced Threat Defense solutions to detect, engage and respond to malicious activity inside the perimeter. Acalvio’s ShadowPlex is based on patented innovations in deception and data science. This enables a DevOps approach to deploying enterprise-scale pervasive deception, with zero-admin. Acalvio enriches its threat intelligence by data obtained from internal and partner eco-systems, enabling customers to benefit from defense in depth; reduce false positives; and derive actionable intelligence for remediation. The Silicon Valley based company is led by an experienced team with a track record of innovation and market leadership and backed by marquee investors. For more information, please visit www.acalvio.com.